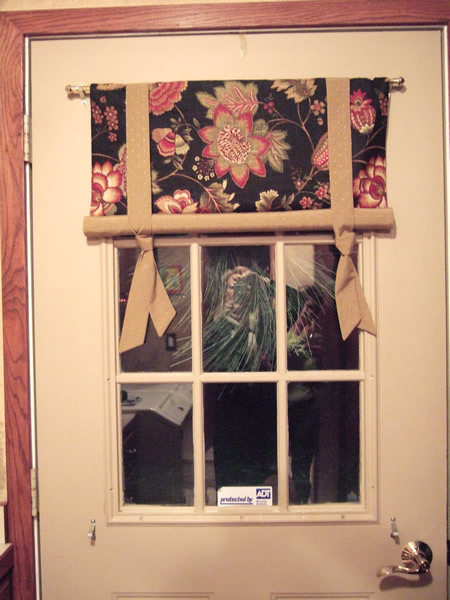 Side Door Decorative Shade - Sew What? Sew Anything! This is a great little mock shade to dress up a side door. Do you have a dramatic fabric as the centerpiece to your home decor? Here is a good idea to use often overlooked opportunities to reinforce the theme. A side entry door into a mud room or utility room is a fun place to keep your theme going. This kind of project can often be complete and using fabric and trim leftovers. This side door was in my client’s laundry room. It really added that warm feeling to a rather utilitarian utility room.